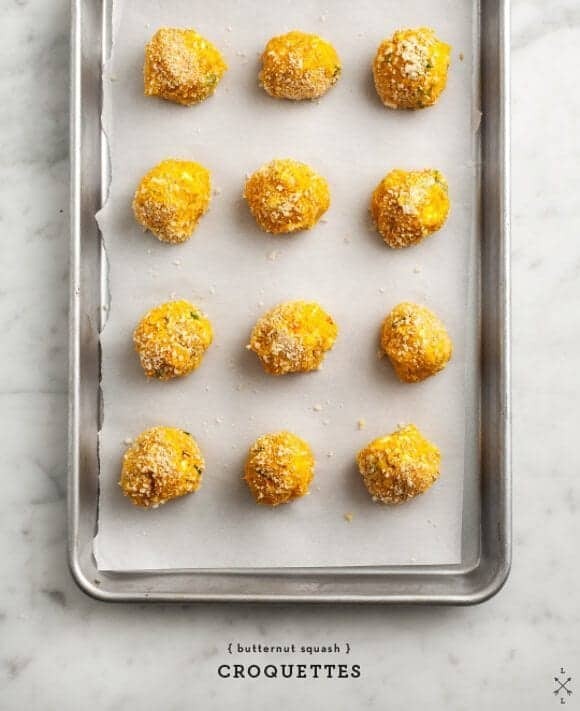 Butternut Squash Croquettes - these healthy baked veggie fritters are a delicious appetizer or snack. I don’t have much of a weakness for fried foods. French fries don’t make me crazy, I never really cared for fried chicken… but whenever we’re on vacation, I find myself ordering little balls of fried stuff everywhere we turn. Cod croquettes in Japan, arancini in Italy, and all kinds mashed veggie fritters (with tangy yogurt sauces) in London. Since we’re currently not on vacation, these are baked, not fried… but I promise they’re so good that you likely won’t even notice. 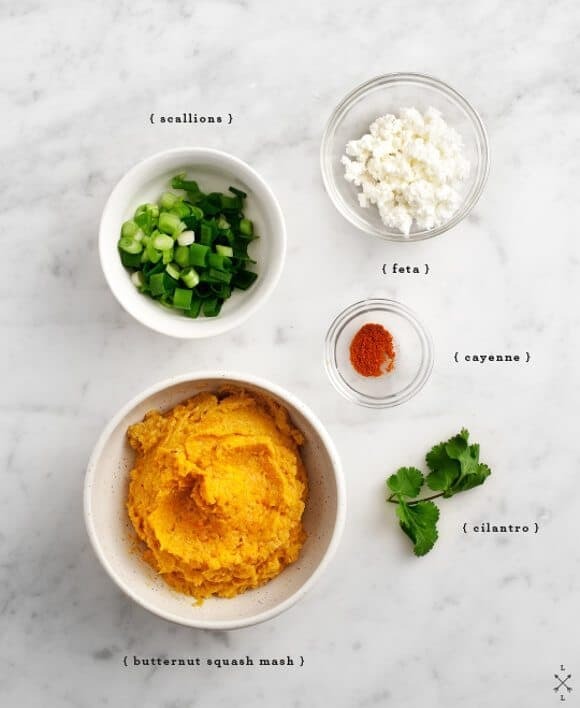 I mash creamy butternut squash with cumin and smoky paprika, mix in some tangy feta, and serve them with a creamy light yogurt sauce for dipping. They’d be great as party food but, really… Jack and I often sit down to a plate of these, a glass of wine (or two), and call it dinner. 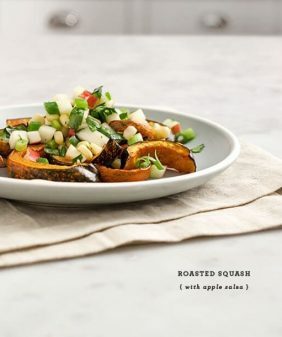 Roast your butternut squash in a 400 degree oven for about 40 minutes or until it's soft. I roast mine whole (make a few holes in it with a fork), and then cut it in half lengthwise (and save the other half for another day). When it's cool enough to touch, scoop out the soft flesh. If it's not soft enough continue cooking it. Using a potato masher or a fork, mash the butternut squash with the garbanzo flour, olive oil, garlic, cumin, paprika, cayenne, a touch of maple syrup, and a generous sprinkling of salt. Stir in the scallions, feta, and chopped cilantro. You can taste it at this point and adjust seasonings... (although keep in mind that the flavor gets infinitely better once they're cooked). On a large plate, spread out the panko bread crumbs. Spoon about a tablespoon amount of the mash and shape into balls (as best you can, it's messy). Then gently roll them in the panko. (you might not use all the panko, it's ok). Bake in a 350 degree oven for about 20 minutes or until golden brown.. If you have a broiler, turn it on during the last few to help the golden-ing along. While the croquettes bake, stir together the yogurt sauce ingredients. Set in the fridge to chill until ready to serve. You are lucky you don’t go crazy for fried foods, french fries are my weakness! Would whole wheat flour be a suitable substitute for the garbanzo bean flour? Just wondering if you tried the whole wheat flour in the end and how it worked out? I’m not sure i’d be able to find the garbanzo bean flour around these parts! Okay, the recipe looks amazing, but the cookbook – you just MADE MY MONTH! I was in England a year ago and laid my eyes on that cookbook in a 1/2 price book store. But with an armload of cookbooks and no place left in my suitcase to pack them, I had to walk away with just a photo of the book on my iPhone with a promise to buy it on Amazon at a later date. Skip forward a few months, my iPhone was stolen in Chicago along with a dozen or so photos of cookbooks from that trip that I still hadn’t purchased. For some reason, we couldn’t access the photos on our computer on the backup, so I was at a loss. But today, TODAY! You literally made my day. Thank you from the bottom of my cookbook loving heart. oh I’m so glad! What a sad story :). It’s really such a great book… I die over the design of it just as much as the recipes. The design is what caught my eye in the first place too – I think these books would make fabulously memorable gifts for holidays, birthdays, etc, just because of the design. Those look so delightful. I adore croquettes. Never thought about using squash before. Amazing idea! Wow, that looks fantastic. I’m definitely trying this recipe. 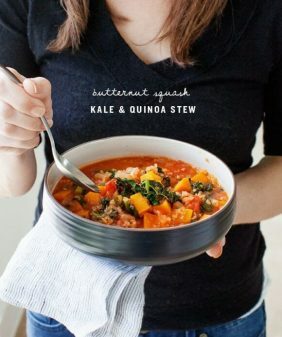 I would consider using sage, nutmeg, and a little cinnamon since they work so well to enhance the butternut squash flavor. can’t go wrong with those flavors! With a glass of wine? That sounds about perfect. A great, healthier alternative to a traditionally deep friend croquette, but with all the same, crispy crunchy gooey factor. Heavenly. Seriously cannot even handle the idea of this recipe!! And the color. And flavors. Ahhhhh. Definitely making these. I must admit, I am a sucker for french fries. What a genius idea. 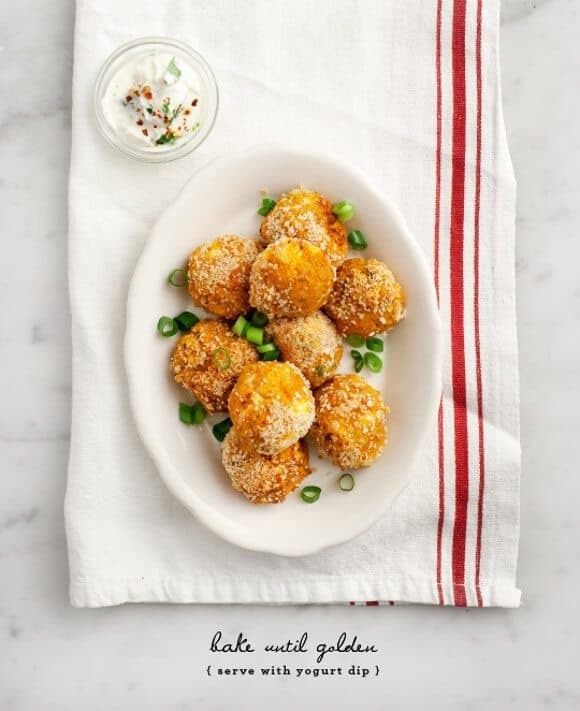 I want to add some crunchy quinoa to these little balls. Mmmm these look delicious! Just when I was all out of new ideas for butternut squash this year. 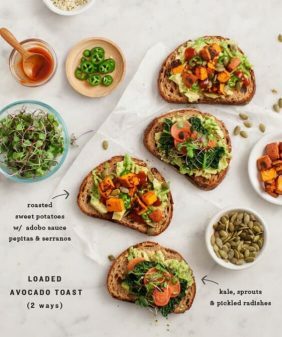 These look super super delicious! 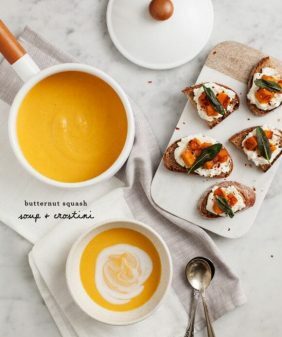 To be honest mine might be a little more like yoghurt with butternut squash croquettes – I put yoghurt on absolutely everything!! Ooh, I just might have to take your suggestion and have these for dinner with a glass o red. For those who were curious – garbanzo bean flour has some special property that helps it bind, like eggs, so I’m not sure you could sub it in this recipe with adding eggs or some other binder. Hi Elizabeth – thanks for mentioning that… You’re right, whenever I’ve made other patties & things like this I’ve used breadcrumbs and eggs to bind them together… the garbanzo flour really made them hold together. 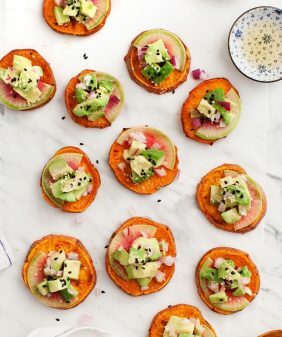 What a delightful looking treat and a perfect little meal idea! Love it. These look and read delicious, and I appreciate that they’re gluten-free. I imagine they’re best served as appetizers, but would make for a nice meal served alongside a simple salad. Thank you. Oops, well I guess I missed the “Panko bread crumbs” for rolling… Any suggestions on a good substitute other than crushed brown-rice crackers or toasted, finely-chopped almonds? Gluten free panko is even at my Publix in a dinky Florida town, so it must be pretty easy to find. I use it all the time. I am gluten free by necessity, and I love your recipes! They are often adaptable to gluten free diets. Thank you for this one! Thank you very much for the quick reply and great suggestions! If I’m dairy free, any suggestions for what I can sub the feta with? These look amazing! Hi Carla, you can just omit the feta – there’s so much flavor already that you won’t even miss it. I love croquettas and I love that book but somehow, I’ve never put both of those together and made them which I’m really regretting now. This looks and sounds beyond delicious! Yum! Croquetas remind me of my time living in Madrid, when I first discovered how wonderful they are. Your take looks delicious! Do they get crispy in the oven? I’ve tried baked falafel and had a tough time getting them to crisp up. This looks so good. My husband is not a fan of squash, but I think I could get him to eat it this way. 🙂 And, as always, such beautiful photographs. great recipe! i switched the garbanzo flour for a mix of panko and regular flour + two eggs and it works just fine! I love your recipes because they combine things in new ways that I normally wouldn’t think of. (Did I post this comment already on another recipes, or is it just something I think to myself every time I try one of your recipes?) Thanks for the kitchen inspiration! I didn’t have garbanzo flour, so tried what the above post recommended with flour and eggs. I think I added just a little too much flour because it tasted a little floury, but it worked for holding it all together. When I ran out of your delicious yogurt sauce, I used sour cream mixed with hot sauce and it worked well with these too! Anyway, I was wondering if you think that the result would be the same, using Hokkaido pumpkin? Yes, I think the result would be pretty similar. Would you believe I’ve never had a croquette? I think it’s about time to change that. Your baked version looks marvelous and I have no doubt I’d prefer it to the fried version anyway. Made these for dinner tonight – YUM. At first I though there would be enough left over for tomorrow’s lunch. But, they were soooooo good that we couldn’t stop eating. Guess we’ll be having the other half of the roasted squash with the yogurt sauce that I managed to scrape from the bowl. Thank you so much for this recipe! 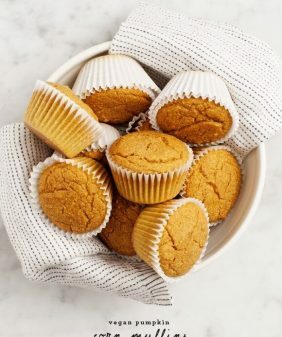 Could these be made ahead of time and frozen? Would I still bake them using the same tempurature and time? Thanks! I haven’t tried it but I would imagine they would freeze well. You’ll probably have to bake them a little longer. These are fantastic. I did not have garbanzo bean flour so I subbed in unbleached all-purpose flour. It was a little difficult to bread them, but it worked well if I laid them on the plate and then tossed breadcrumbs on them instead of rolling them around. I was liberal with the breadcrumbs and cooked them a bit longer hoping that the extra crispy breadcrumbs would help it hold together. They held together pretty well and they weren’t dry. I made these last night as part of a asian fusion meal, served it with a peanut butter dipping sauce instead, a true success! I also made your Kale chips with the miso dipping sauce (the bowl was empty in 5 minutes!) These are absolutely lovely! Looking forward to trying more of your recipes! Hi Elora – I’m so glad they were a hit! OMG – These look amazing. I Love butternut and anything crumbed! I made these last week and loved em so much my second batch is currently in the oven. yum!! !